Recently, Goodnight Boutique has been working on a truly delightful range of jewellery. 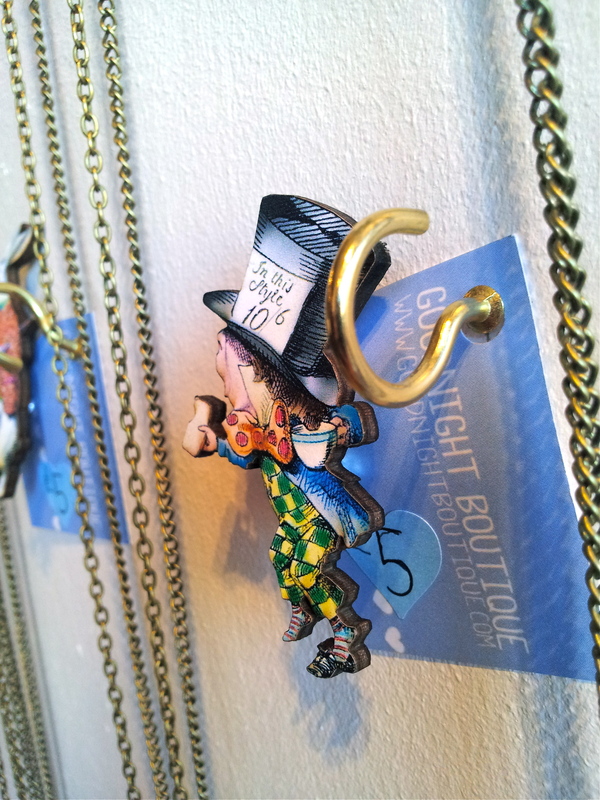 Inspired by the works of Lewis Carroll’s ‘Alice In Wonderland’ we’ve made little gold and silver teapot and teaspoon necklaces and earrings, and woodcut brooches and necklaces featuring illustrations from the books themselves! As of today, the utterly lovely cupcake heaven that is Cherry Blossom Bakery, will be stocking Goodnight Boutique’s ‘Alice In Wonderland’ range! Situated on Church Street, in Macclesfield, you will find the perfect place for a spot of tea, and a browse of wonderful handmade jewellery, as well as the lovely artwork that lines the walls, created by local artists. What makes it even better, is that the Bakery very kindly doesn’t take a cut, and instead asks that all crafters and artists donate 20% of all profits to the East Cheshire Hospice. So, you can buy yourself a little treat, and do your bit for charity!